Snow Sky got the better of a thrilling duel with Brown Panther, owned by former England striker Michael Owen, to win the Yorkshire Cup. 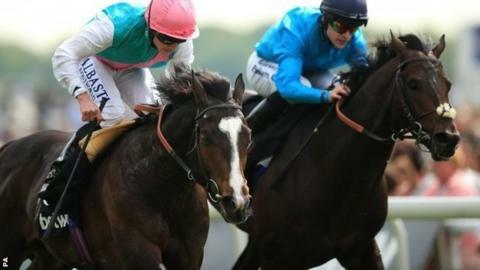 The 5-2 shot, ridden by Ryan Moore for trainer Sir Michael Stoute, may now be aimed at the Melbourne Cup in November. Snow Sky and Brown Panther went head-to-head up the York straight, with just half a length separating the pair. Meanwhile, trainer Mark Johnston enjoyed a Friday five-timer, including four winners at the York meeting. Yorkidding (5-2) won the concluding handicap following wins for Delizia (11-2), Notarised (9-1) and Indescribable (12-1). The victory of 11-8 chance Buratino at Newmarket completed a 7,023-1 five-timer. Very fine performances from the first two in the Yorkshire Cup bode well for the months ahead. It was striking how quickly Sir Michael Stoute nominated November's Melbourne Cup as his horse's long-term aim though it's unclear where he might go before that. Brown Panther - aged seven and conceding 5lb - went down only after a brave fight, and it's the Gold Cup at Royal Ascot next. The big question is whether his stamina will last the longer 2.5 mile distance there. In 2014, it didn't. At York, Owen said he was "thrilled" by his horse, who is likely to run in next month's Gold Cup at Royal Ascot. Havana Beat stayed on stoutly, passing Romsdal to claim third.